Do you have shoes fetish? Or are you a Shopaholic? Random Fact: I love to shop online - Like love-larvvve-luvvvv - almost everything I own, I got them online. Bags, shoes, dresses, tops, skirts, socks even facial pads! AND I FOUND THE PERFECT SOLUTION! 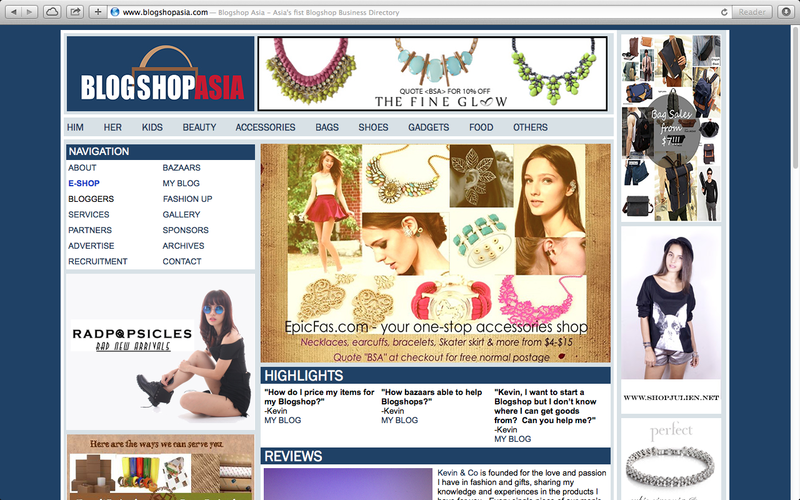 Introducing Blogshop Asia - Asia's First Blogshop Business Directory! Your one stop to everything you ever need with just a few clicks on your mouse; beauty information, fashion chats, lifestyle, gossips, entertainment news, product reviews, online shopping experiences. Top to toe all decked in stuffs I got online! Best of all, it's not only for consumers such as me and you! Unlike other Blogshop directories, it is a Social Network for Blogshops and their customers. The page's interactive nature provides buyers and seller a platform for communication and initiating business deals. You can have absolute confidence in Blogshop Asia as it is the perfect platform for budding online stores as a platform to advertise. They take pride in being the premier consultation hub, hitting more than a million hits a month. ON TOP OF THAT, they are ranked TOP 5 by Yahoo and Google search engine. What more reasons do you need!? Lady Rosalie//Kayla Wong. Simple theme. Powered by Blogger.